By Peter Anderson 2 Comments - The content of this website often contains affiliate links and I may be compensated if you buy through those links (at no cost to you!). Learn more about how we make money. Last edited November 14, 2018 . 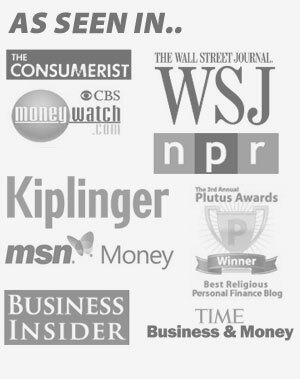 Over the past few years I've had the opportunity to meet quite a few fellow personal finance bloggers here in the Twin Cities area through my involvement in the FinCon Local meetup group. It's always fun to meet people with similar goals and aspirations, and who just get this “blogging thing” that we do. It's also inspiring as a writer, as we have now had at least a couple of the members in the group become published authors. 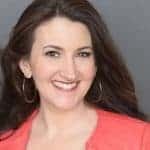 A couple of years ago one of the bloggers in the group, Carrie Rocha of PocketYourDollars.com, wrote a book that I reviewed called “Pocket Your Dollars: 5 attitude changes that will help you pay down debt, avoid financial stress, & keep more of what you make“. The book looks in depth at how our attitudes, and the things we believe about money, help to shape our financial lives. 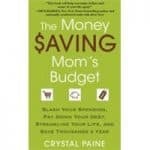 It's a good read, especially as you begin a long journey of getting your finances in order. In a few short weeks another blogging buddy from the FinCon group, David Carlson of YoungAdultMoney.com, is publishing his first book. It's called, “Hustle Away Debt: Eliminate Your Debt by Making More Money“. The book takes a look at how people (and especially millennials) can work their way out of debt and get ahead, by taking their spare time and using it to their advantage by earning money through “side hustles”. The topic is one that's close to my heart, and knowing David's passion for the topic and how hard he's been working on this book, I knew it was going to be a good read. So today, let's take a brief look at Hustle Away Debt. 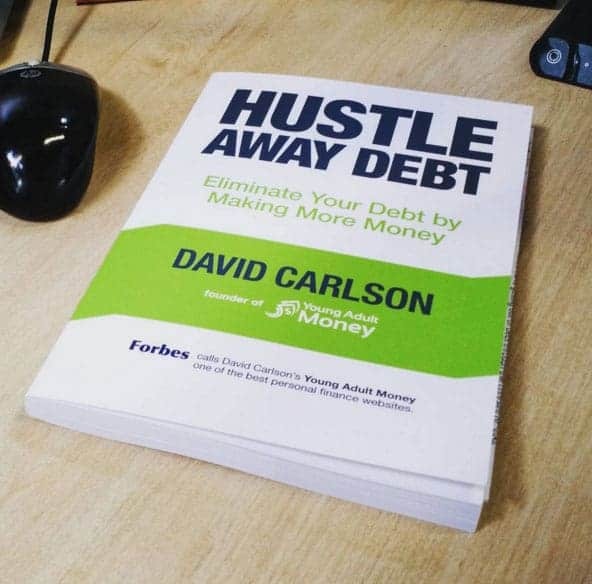 The book opens with an introduction where David talks about one of the reasons why his book is titled “Hustle Away Debt”. David and his wife were married soon after graduating college, and combined they had nearly $100,000 in school loan debt. Their story and level of student debt is far from an outlier in this generation. The average college graduate in 2015 graduated with more than $35,000 in debt, and overall student debt levels recently surpassing $1.2 trillion dollars. Debt is a huge problem, and if you want to do more than just pay the minimums on your debts (in order to retire your debts ahead of schedule), you'll need to find ways to improve your situation. David suggests that one way to do that is certainly to cut costs, but that has limited utility because there's only so much you can cut. Instead he promotes the idea of finding ways to make money money in your free time outside of your normal 9 to 5 job. Your free time now has a job – making money. Before jumping in to side hustles full force, David suggests taking the time to understand your “why” behind the side hustle. Are you doing it to help pay off student loans faster, like the author? Have a lot of credit card debt to pay off? Are you doing it to diversify your income, and reduce risk? Do you just have the entrepreneurial bug, but don't want to risk everything on your new venture? It may be a combination of all of the above, but the awesome part is, making money on the side can help to fulfill any number of goals. Knowing your why can help you to focus your efforts. Before starting your side hustle, it can be a good idea to start thinking about the things you can do before you even start on a side hustle. Are you maximizing your current situation? Are there things you can do to improve at your current job? Can you get negotiate a raise or get a promotion? Can you improve by finding a new job? Are there things you can learn to make more money? Do your best to maximize your 9 to 5. Beyond that, it's a good idea to eliminate wasteful spending in your budget so that your extra earnings have that much more impact. Paying too much for cable TV? Cancel it. Paying too much for a huge house, when you could downsize and pay a lot less? Sell it. Have a high interest credit card debt that could be refinanced at a lower rate? Do it! Finally, figure out what your capacity for side hustles is. Just how much free time do you have that you can use to work on side hustles? Are there things in your life you need to say no to, in order to have the time? What things will you be able or willing to sacrifice in order to make money on the side? The meat of David's book is in helping you to find the right side hustle. David breaks down the side hustles into two main types, “quick money” side hustles, and “long tail” side hustles. Quick money side hustles: Quick money side hustles are those that will provide you money pretty quickly after you start. These types of side hustles are ideal if you need guaranteed money right away. Examples might include working part time at a retail store on the weekend, delivering pizzas, seasonal holiday jobs, mystery shopping and more. In many instances you're trading your time for guaranteed income. While the ceiling on what you make might not be that high, you'll have at least some guaranteed income. Long tail side hustles: Long tail hustles are those that do not typically guarantee income, require more of an entrepreneurial mindset and sometimes take a while to build before you starting making an income. Instead of just trading time for income you're building a business. reputation or a brand that in the long run will give you a higher potential earning ceiling than some of the quick money side hustles. There may be more risk involved in some of these side hustles, or a longer time between starting and seeing a return, but in the long run it's often worth it. When considering what type of side hustle you want to engage in, it's important to figure out what type of a side hustle will fit into your current lifestyle, family situation and free time availability. If you're a single person you'll likely have a lot more flexibility than if you're married and have children. Many people (me included) even engage in multiple side hustles, some for quick money and others that are more long tail. So how do you choose a side hustle? David suggests thinking about things you're already doing that can help lead you to a side hustle. What are some hobbies that you enjoy? What skills do you have, either from a day job, or from outside of that realm that might lend themselves to a side hustle? What are some things that you're interested in that you have some expertise in? Quick cash side hustles: These might include things like food delivery, waiting tables, working retail, child care, other part time jobs. Online side hustles: These are side hustles that you can do wherever there's an internet connection. Things like blogging, selling on Etsy or Ebay, being a virtual assistant and designing graphics would all fit this mold. Small business side hustles: These are side hustles that can start small, but have the potential to grow into a full time business with a larger income potential. Things like creating an online or physical product to sell, wedding related services, accounting services and more. Self-employment side hustles: These are side hustles where you become your own boss. Things like freelance writing, web development, programming, photography could lead to you being your own boss. Local side hustles: These are money making endeavors that require you to be present – to do something in your local area (not online). Things like being a dog walker, pet or house sitting, renting out a room in your house, reffing for local sports, or being a delivery driver for a courier service. What it comes down to is that there are a thousand and one ways to make money on the side if you want to. From online ventures to local services and part time jobs. You just have to figure out what will fit your lifestyle and go from there. Check out David's book for a ton of ideas, far beyond what's listed above, to get you started. In the last section of his book David looks at a variety of the side benefits of having a side hustle, from the connections that you'll make, to the improvements in your finances and a broader skill set that makes you a more valuable employee. 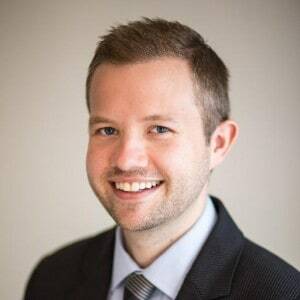 He also looks at hacks for side hustlers, tools that will help you to stay organized, other important (if mind numbing) considerations like taxes. 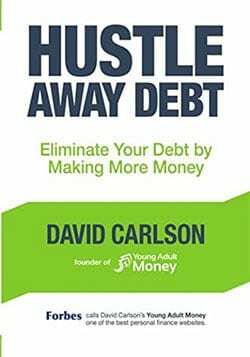 If you're looking to strike out and find ways to make extra money, David's book “Hustle Away Debt” may be just the book you're looking for. It will get your creative juices flowing, give tips and tricks from someone who's been down the same road, and hopefully end up helping you to put more money in your pocket. I highly recommend it. Thanks for the review Peter! I’m so glad you liked the book! This is honestly the best review/write-up on it that I’ve seen, so thanks a ton! Glad you liked the review, I enjoyed the book – side hustles are a topic near and dear to my heart, and I think you covered the topic well! Congrats on the upcoming release!